OK, so it's actually a bar, not a pub. And the publicity is being put into the pub bar and not the other way round. But it was the best pun I could think of to announce CAZBAR's benevolent offer to fellow Worcester Park businesses in these tough economic times. "I would like to offer FREE advertising to businesses in Worcester Park (or those that live in Worcester Park and run a business). There's no catch, I just want to help Worcester Park grow into a better community high street and I believe that can only be done if we help each other." The free adverts will be placed on a 10 inch digital screen behind the bar and a 32 inch screen in the window facing onto Central Road. 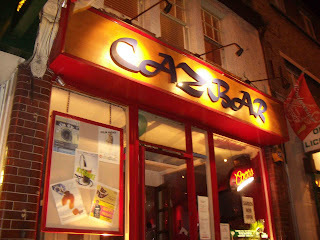 The window screen will be on during morning 'rush hours' as well as during CAZBAR opening hours. Any business interested in taking up the offer should send a reasonably-size JPG file to barzltd@googlemail.com.